We think about meetings all the time (I know! What a life!) 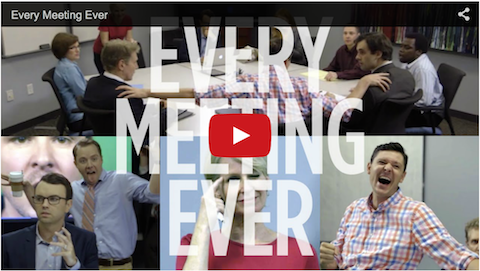 and have collected some of the most useful videos about meetings that we’ve enjoyed while seeking perspective here at Lucid Meetings. You'll learn something new that you can use to improve your very next meeting. I promise. You'll laugh, and laughter increases productivity! Let's start with humor, aka "The Problem Statement"
Do you need a way to get your team involved in your journey towards better meetings? Consider sharing one of these quick videos that help make the problem achingly, hilariously clear. David Grady’s 2010 video was the first widely shared dramatization of the awesomeness that is the conference call, and people still send me copies of this one on a regular basis. For Mr. Grady’s advice on what exactly you might do to change this situation, see his TED talk linked below. You haven’t seen this one yet? Really??? Just stop right now and dedicate your next 4 minutes, because it’s time. Why include two videos by the same guys? Because they’re funny, and they’re just true enough to hurt. And now, time to get serious. I recommend watching these two together, then taking a few minutes to reflect – a quick walk, a deep breath. Together, these two talks introduce a perspective on what it means to lead well, and a framework for applying this leadership to meetings. "Why good leaders make you feel safe"
Ok, so this is not specifically about meetings, but it is about the human dynamics you should understand to lead meetings well. From the TED website: What makes a great leader? Management theorist Simon Sinek suggests, it’s someone who makes their employees feel secure, who draws staffers into a circle of trust. But creating trust and safety — especially in an uneven economy — means taking on big responsibility. "The Art of Facilitation: Changing the Way the World Meets"
Jay W. Vogt has facilitated thousands of meetings and retreats. In this talk he discusses the relationship between group meeting structures and the results we get from those gatherings. Ready for something specific and actionable? Try one of these techniques. "The Secret of the Starting Question"
I must have forwarded this one a dozen times. From the website: How many times have you asked a question and received complete silence in response? Master Facilitator Michael Wilkinson shows you the secret to the starting question. Much like when starting a fire when you have all the right materials, asking questions in this way almost always will result in a bonfire of responses. The technique takes some practice, and when used regularly, will transform your meetings. 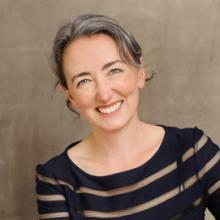 Nicole Steinbok explains how to keep meetings to 22 minutes or less, following just 9 easy steps, in 5 dynamic minutes. Saving the best for last, we present "Knee Tag"
Let’s end with another knee-slapper. Just the thing to perk up your group in the middle of one of those well-designed, but oh-so-long all day meetings. Do you know of a short meeting video that inspires, amuses, or otherwise advances the cause of better meetings for all? Let us know in the comments or on Twitter and we’ll help spread the love.